Unics Kazan hung on for dear life to beat Dinamo Banco di Sardegna Sassari 68-72 on the road Thursday and move resolutely into Top 16 contention in Group A with its third consecutive victory under new head coach Evgeny Pashutin. 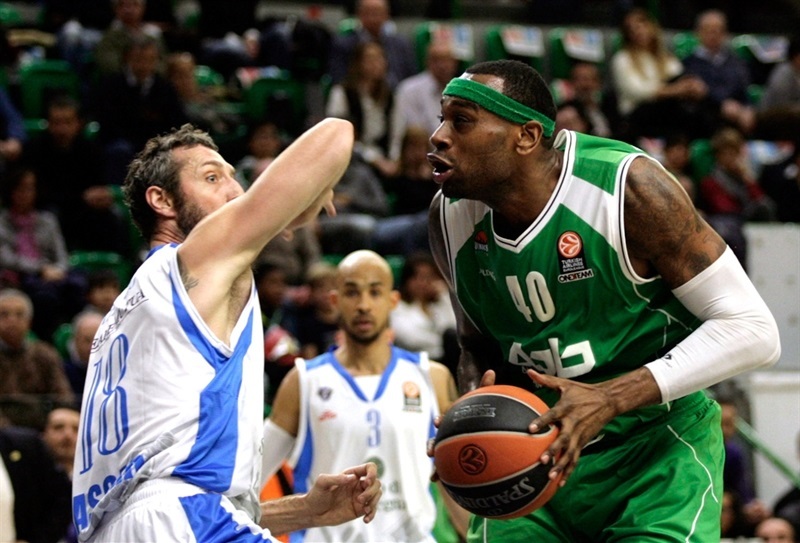 Unics improved to 4-4 and is now tied for third place in Group A with Zalgiris Kaunas. Sassari fell to 1-7 and was eliminated from the Top 16, but will continue playing in the Eurocup Last 32 in the new year. 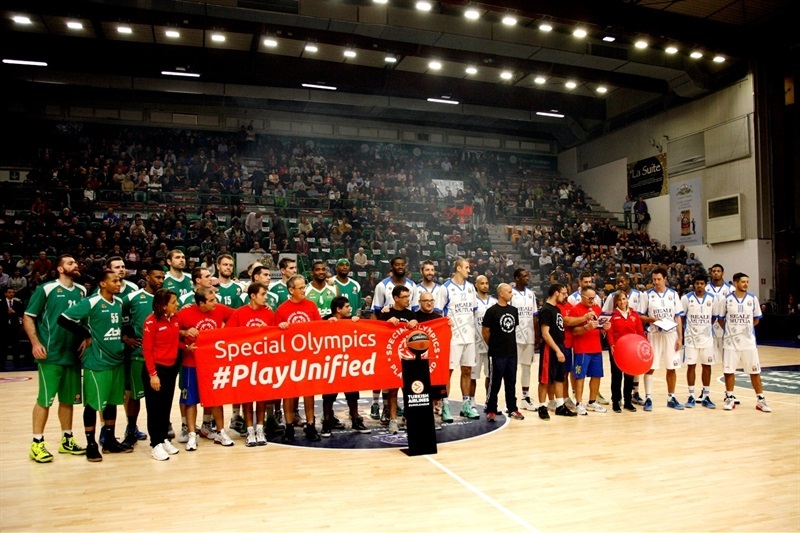 After a 3-12 run at the end of the first half gave Unics consistent double-digit leads, Sassari made up all of an 18-point, second-half deficit to tie 60-60 on David Logan's fifth three-pointer with 5 minutes to play. Pavel Antipov answered within seconds with his own, however, and Unics never lost the lead again, although Sassari stayed close. The hosts were within 2 points with 20 second left when Antipov pulled an offensive rebound, got fouled and made both free throws to seal the outcome. D'or Fischer ruled inside for 23 points and 15 rebounds for the winners. James White seconded him with 14 points and Curtis Jerrells added 11. 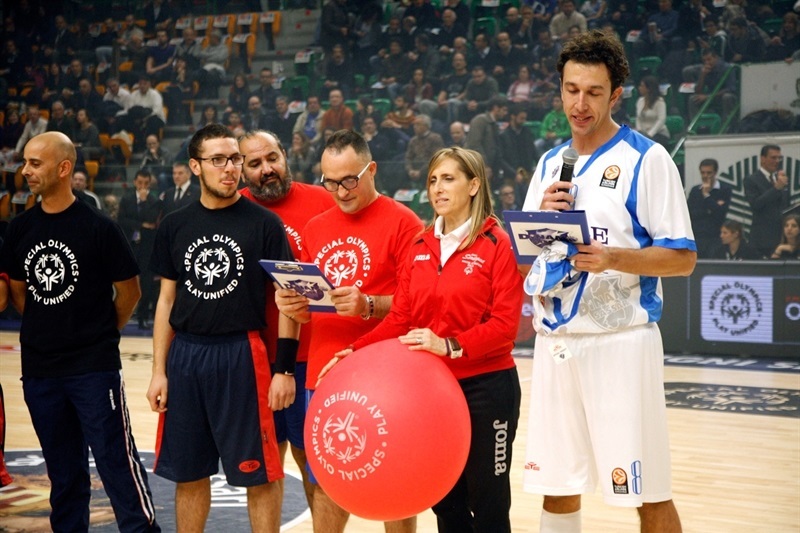 For Sassari, Logan finished with 17 points, while Rakim Sanders had 12 and Edgar Sosa 10, but the dream of the Top 16 was lost as the hosts struggled for three quarters and didn't have time to pull out a comeback that would have revived their chances. Fischer's foul-line jumper got the scoreboard started before Sanders answered for the hosts. Free throws by Jerome Dyson supplied Sassari's first lead, but Fischer dunked inside to make it 4-4. A second-chance triple by White was the game's first, then he scored in transition on a feed by Nikos Zisis to make it 4-9. White was feeling it, so he drove for a layup and the extra free throw. 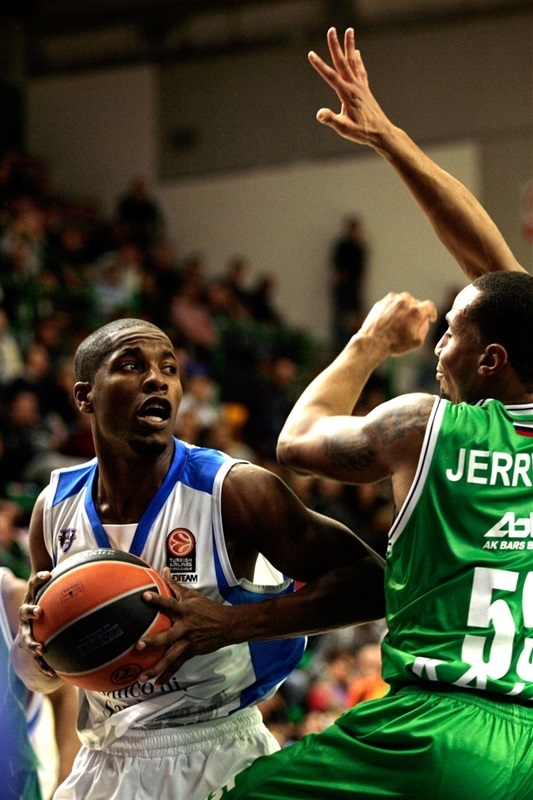 Jeff Brooks reacted for Sassari with a short jumper that Sanders followed with a three-pointer to make it 9-12. Fischer made 2 free throws before Sanders and Keith Langford traded layups. Miroslav Todic got loose for a dunk, but Langford answered from downtown to make it 13-19. Fischer made a tip-in that Brooks matched with a loose-ball basket. With another second-chance possession, Jerrells hit a step-back jumper before Sosa's free throws ended the first quarter 17-23 in favor of the guests. Sanders got Sassari closer with an acrobatic reverse layup of David Logan's steal to open the second quarter, but Sergey Bykov bettered him with a triple at the other end to make it 19-26. Giacomo Devecchi fed Todic for his second easy basket, while Dimitry Sokolov scored inside for Unics. Fischer took a nice feed from Kostas Kaimakoglou for one basket then drilled a short jumper for the game's first double-digit lead, 21-32. 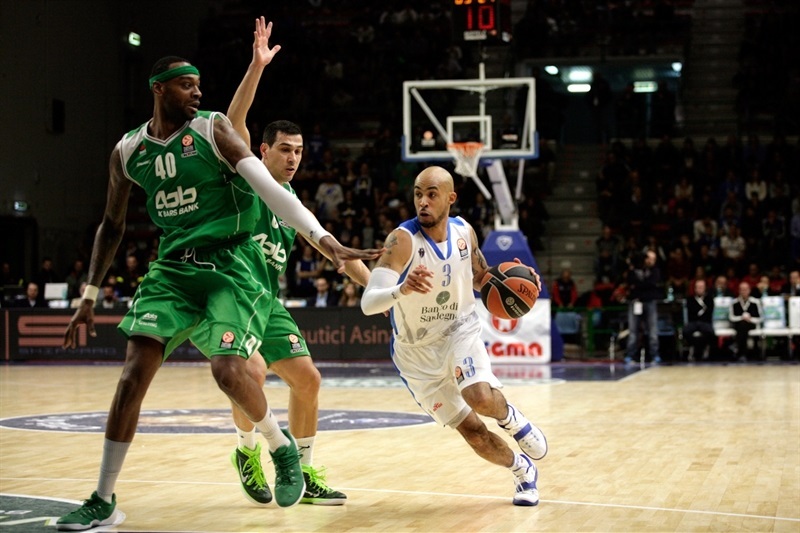 White added a jumper to the Unics edge, while Sosa scored in transition for Sassari. Fischer made a turnaround inside, and after a timeout, Sosa made 1 of 2 free throws. Fischer was left open for yet another foul-line jumper for a new high lead of 24-38. Brooks got two points back for Sassari on a nice back-door dunk, but Kaimakoglou matched it to leave Unics in control, 26-40, at the break. 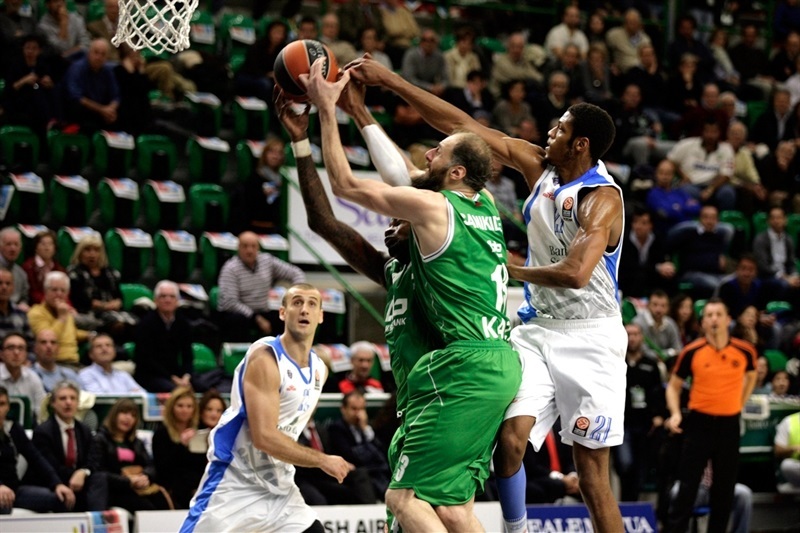 Fischer fed Kaimakoglou for an easy layup before Sanders struck from the arc for Sassari to start the second half. Sassari's defense got some stops before Logan drilled a triple at 32-42, forcing a Unics timeout. Zisis came out of that and drilled a three-pointer in response for the visitors. Shane Lawal made an acrobatic put-back for Sassari before Jerrells stuck a triple in transition, then after a couple of minutes, did it again from the same spot for the game's high lead so far, 35-51. 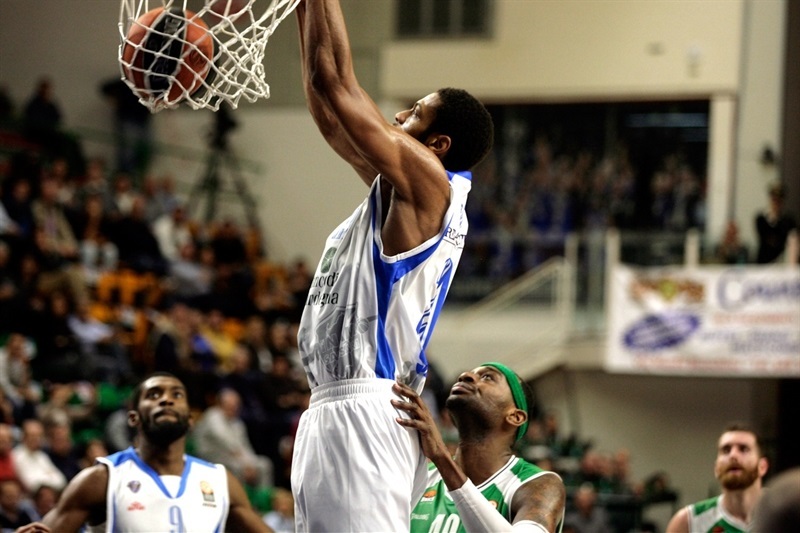 Antipov joined the Unics scorers, then Lawal and White traded easy baskets. Sosa found Logan in the corner for a three-pointer. White drove untouched from the other corner for a slam. Sosa drove hard for the next basket leading a 42-58 scoreboard after 30 minutes. Sosa started the fourth quarter with a face-up triple to cut the difference to 45-58. After a timeout, Logan copied his teammate and added a steal and fastbreak dunk to suddenly make it 50-58. Now Unics needed a timeout, but right after it, committed another in a series of turnovers that led to Brooks hitting a deep two-pointer. The Sassari defense held again, and Logan converted Todic's offensive rebound into a step-back triple to suddenly make it 55-58. 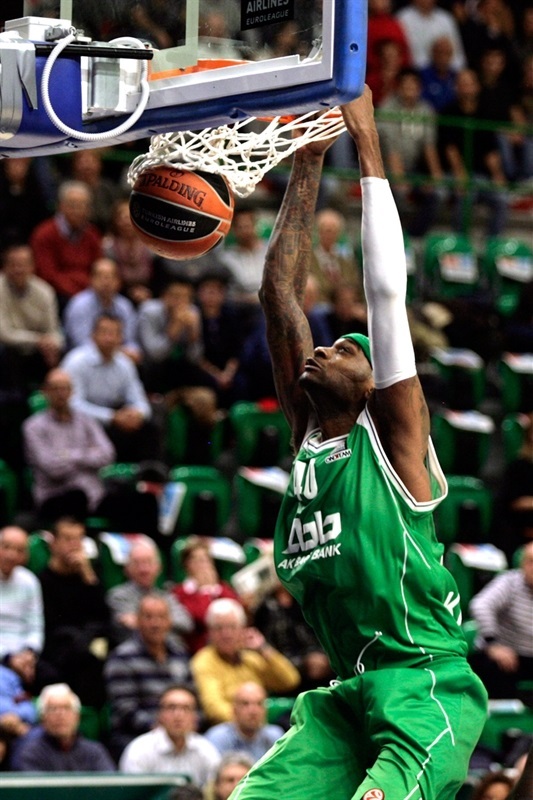 Jerrels fed Fischer for an alley-oop dunk to end Sassari's 13-0 run since the final play of the third quarter, but Todic answered with a jump-hook at 57-60. Logan's next three-pointer, his fifth, completed the seven-minute, 18-point comeback with a 60-60 tie. Within seconds, however, Antipov stepped up with his own to put Unics back in front. 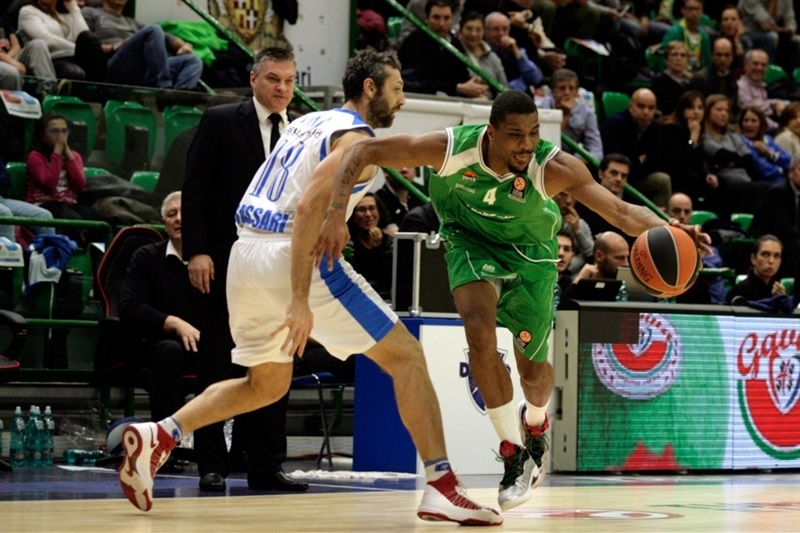 After a couple Sassari misses, Jerrells made a huge drive for a 60-65 Unics advantage with 3 minutes left. Devecchi stepped up with a triple for Sassari, but Unics found Fischer for a dunk and the accompanying free throw for a 63-68 score with 1:30 to play. 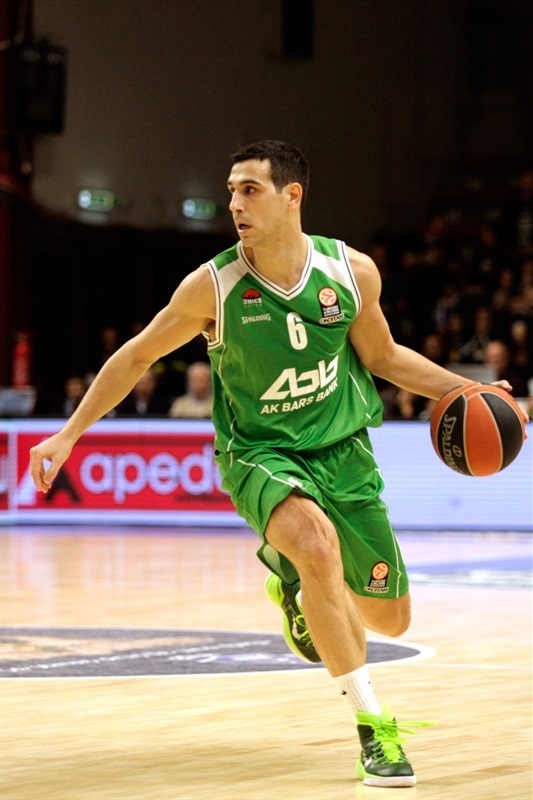 Devecchi repeated his marksmanship for the opposite side to keep Sassari close at 66-68. Fischer responded with another foul-line jumper going into the final minute. Devecchi put back an offensive rebound, but at the other end, Antipov pulled an offensive rebound, got fouled and made both shots for a 68-72 score with 10 seconds left, enough to end Sassari's first Euroleague season prematurely and position Unics for a run at the Top 16. "The first time we played with not so much grit and aggression; instead, in the second time we came to the court with a lot of energy, with the right attitude. It’s very important for me to see this right attitude. Congratulations to Kazan: they were very good to read the crucial situations the right way. " 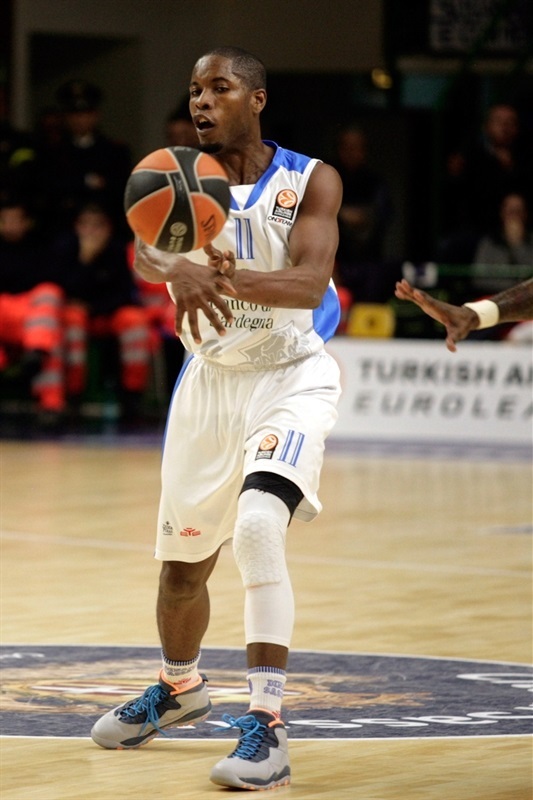 "We knew that it would be a hard game, Dinamo played a good game and they proved to be at the Euroleague level. We kept the concentration all the time, also in the crucial moments. My guys have experience and they know how to win a game. It was another step toward the Top16." "We played a game point to a point with the a team that probably will go to the Top 16. We need to learn more and more how to use our grit for the whole game. " "It was an important game. We knew that Dinamo would be a difficult team to beat. I’m proud of my team because we had lucidity in the crucial moments. 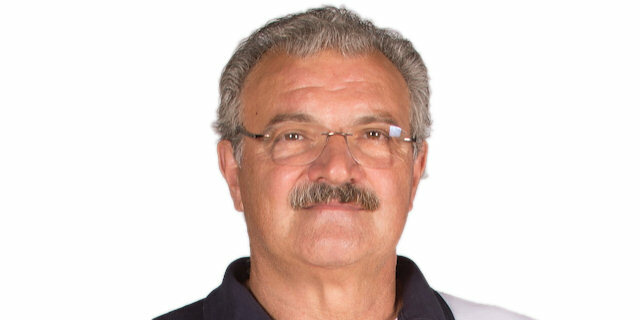 Congratulations to Sassari."